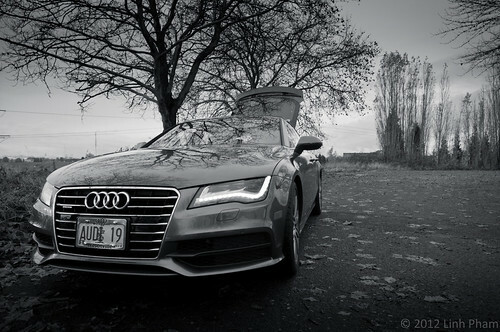 I was given the opportunity to drive an Audi A7 for the weekend right after Thanksgiving. On the afternoon of Black Friday, I stopped by Audi Wilsonville to drop off my S5 and pick up the keys to the 2013 Audi A7 that was part of their loaner fleet. The Daytona Gray A7 was well decked out with the Prestige trim level with black interior and headliner, 20″ Sport Package, Cold Weather Package and the famed LED headlights. Instead of taking the clogged freeway and highways back home, I went up Wilsonville Road, snaked my way to Newberg and hopped on to the windy roads to Highway 219. With the supercharged 3.0-litre V6 engine and eight-speed Tiptronic gearbox set to Dynamic in the basic Drive Select settings, the large and relatively heavy A7 felt more like a tuned A4 2.0TFSI. 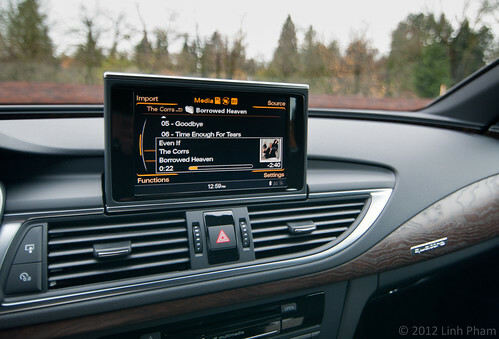 It did take a little bit of time to get used to the relatively numb steering feel, when compared against the S5’s steering feel, but I still felt confident in where the car was going to go. As I climbed up the hills north of Newberg, the clear view quickly diminished in a blanket of fog and some rain. Dynamic mode gave way to Auto in the name of caution and kept the Tiptronic in normal drive mode, I was able to make it through and back down into the valley. The roads started to straighten out a bit more. I started to play with the shift paddles a bit more and the gearbox, particularly in Dynamic mode, shifts were fairly quick and were quite firm. There were some hesitations when I wanted to downshift before entering a curve, but nothing like the older five-speed Tiptronic gearboxes. Keeping it out of Dynamic mode and not in S, the gearbox definitely wanted to climb the gears pretty quickly. For the most part, in Dynamic mode, it doesn’t seem to try to cling on to 7th or 8th when I lay on the accelerator like other fuel economy-minded slushboxes tend to do. It will climb into 7th and 8th if you leave it in Auto, Comfort or normal D drive. Another fuel economy-minded feature that the Audi A7 is equipped with is an automatic engine start/stop system. The system was turned off when I got the car and I left it off until Saturday morning. For the trip down to PDX C&C, I decided to turn on the start/stop system to see how well it worked. The system did not kick in until the engine got up to temperature nor did it seem to kick in a couple of times when it felt that the battery needed additional charging. Once the system was ready to go, I applied the brakes to stop at a light. After a couple of seconds, the engine turned off as it was supposed to. When the light turned green, I slightly lifted off of the brake pedal, the engine quickly started back up and the car started to creep forward. Now, when the engine started back up, it did cause a little bit of a shake like any cold start would. Sometimes it would be a bit smoother than others. Whether it really had an effect on the average fuel economy was probably masked by my spirited driving. I chose to leave the system on for the rest of the weekend. On Sunday, I did quite a bit of driving around, be it for a bi-monthly run to Costco and to a couple of other stores. This is where the large cargo space came into play. To put it in Top Gear terms, you can probably fit me into the back with the cargo cover down without any problems with room to spare. Below is a picture that I took later that day with just by usual backpack and one of my camera bags just to show how much space it provides for cargo. As you can see, not is there only small hooks on each side for hanging small plastic bags and little pockets. If something were to roll all the way forward into the area, you may have to climb in to reach it. The power operated hatch is a nice convenience when closing, but the speed at which it opens and closes is a bit too slow. Would be nice to have a way to control the speed within the MMI. The rest of the weekend consisted of some additional driving, a couple of quick photo shoots of the A7 and resting up for the week to come. 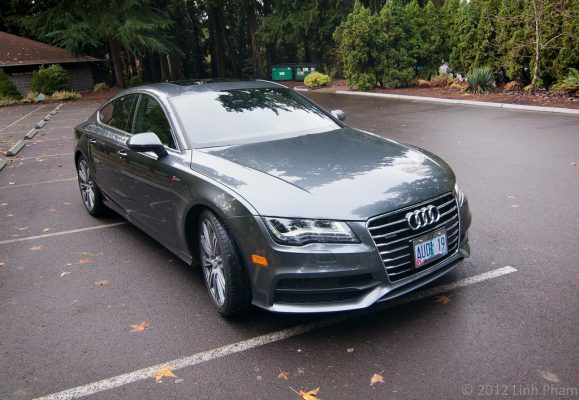 I dropped off the A7 at Audi Wilsonville on Monday morning and drove my S5 to work. Overall, the A7 would make for an excellent daily driver and road trip car and the Prestige trim has many of the features and gadgets that I would want. I maybe could live without the 20″ wheels and tires and drop down to the 19″ Sport Package. The 20″ wheels and tires did make for some harshness when driving on some of Portland’s well worn streets (say the western end of Burnside that cuts through Washington Park). Daytona Gray would be right up there with Glacier White as my preferred standard paint color options. The three additional options that I would plop money down on would be: the Layered Oak Wood Inlays, black headliners, and power folding mirrors (though, I would not make use of the side assist). With destination charges, that would bring the sticker price to $69,720. If I’m not actively using the navigation system to display the map, I would prefer the screen to be retracted. Now, if the screen is retracted and there is a large display in the instrument panel, why does selecting a memory seat button cause the screen to slide back out to display a basic message? Also, there needs to be a couple of redundant MMI menus that should be accessible via the display in the instrument panel, including Drive Select, selecting music sources, and setting repeat/shuffle options. There is a menu button on the steering wheel and can be used to tweak those settings. This will reduce the need for use of the center console screen. Why does selecting shuffle also enable directory repeat when listening to music on an SD card? I would like to be able to shuffle songs within the directory or across all songs on the card. If I keep the Advanced Key in my pocket and step out of the car to quickly grab an item with the engine running, why does the engine shut off? I don’t know if that was due to the automatic start/stop system being on; though, it would happen when the display shows that it isn’t active. The MMI touchpad should allow the person to pan or zoom the map view by using it like a traditional laptop trackpad. Gestures for controlling media playback would also be a nice to have. 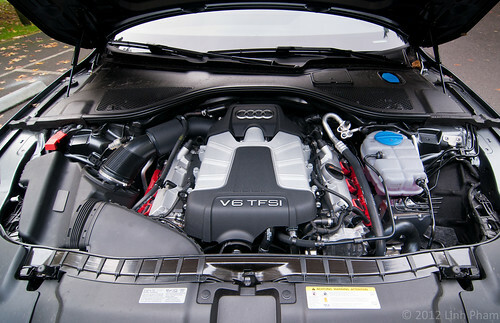 There is also the consideration of how much the A7 costs compared to its platform sibling, the A6. Granted, the A7 is a larger vehicle compared to the A6 and has a slightly more posh interior than an A6; but, is it worth the roughly $6,000 premium? I’m not entirely sure. 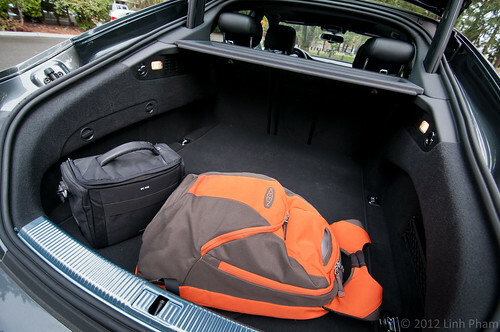 I do like the Sportback design and the extra cargo room and flexibility that it has over the A6. 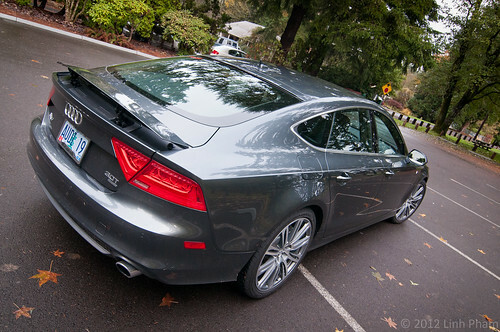 Excluding the rear-end, it looks absolutely gorgeous when compared to the A6. Now, if Audi of America sold the A6 Avant in the US, I think I would have to pass up on the A7 and get the A6 Avant instead. Every time I see photos of the C7 A6/S6 Avant in the UK or Europe, it makes me incredibly sad that it isn’t over here. Yeah, there isn’t much of a business case for luxury wagons in the US; and, I think that may enable Audi to price the A7 as high as it does… at least in the US. There is still a significant price difference between a base A6 Avant 3.0TDI S-Line and a base A7 3.0TDI S-Line in the UK. At the end of the day, it just comes down to how the car is positioned, between the A6 and the A8. BMW does the same thing with the 5 Series and the 6 Series Gran Coupe; though, in that example, there is a significant bump in the level of design and creature comforts in the 6 Series. With that said, I would probably go with an similarly optioned out A6 over an A7. The same would also be true when the 3.0TDI finds its way into the 2014 A6 and A7.